Smyrna was an ancient Greek city and important seaport located at a central and strategic point on the western coast of Anatolia (today Izmir in western Turkey). The early Hellenic settlement lay on a small peninsula, inhabited since the beginning of the 3d millennium BC, on the north-east coast of the Gulf of Smyrna. Excavations have brought to light some of the most important ruins of the city. Two sites of the ancient city are today within the boundaries of İzmir. The first site, known as Old Smyrna, has a few remains dating to the Archaic Period on the north-eastern side of the bay of Izmir. The second, known as New Smyrna and whose foundation is associated with Alexander the Great, reached metropolitan proportions during the period of the Roman Empire. Smyrna competed with Pergamon and Ephesus for the title “First City of Asia”, and claimed to be the birthplace of the poet Homer. The Gulf of Smyrna was supposedly settled by Aeolians (Greeks from the sector north of Athens) at the beginning of the first millennium BC and later by Ionians (Athenians and their immediate neighbours). The site of the original settlement occupied an area of around 90,000 squares and was inhabited for about 3,000 years until the second half of the 4th century BC. Smyrna’s principal place of worship was the Temple of Athena. Its ruins, located in the Bayrakli district of Izmir, date from 725-700 BC. Old Smyrna was attacked by the Lydian king Alyattes around 627 BC and established control over the coastal communities. Alyattes destroyed the city and expelled its inhabitants, and henceforth, for 400 years, it was deserted and in ruins. The polis became a rural village, paying taxes to the Lydian king, and subsequently to the Medes and the Persians. In the time of Alexander the Great, a new, larger city was founded on the slope of Mount Pagus. According to legend, Alexander is said to have wanted to rebuild the city on this location. During one of his hunting expeditions on the slopes of Mount Pagus, Alexander, exhausted by the chase, fell asleep under a tree and had a dream in which two Nemeses instructed him to build a city on this very spot. And so Mount Pagus became the acropolis of New Smyrna. But Alexander did not live to carry this plan into effect and it was only accomplished by his successors Antigonus and Lysimachus. New Smyrna was built at a distance of twenty stadia to the south of Old Smyrna. According to Strabo, the streets of New Smyrna were well paved with stone, and the city contained several squares, porticoes, fountains, a public library, and numerous temples and other public buildings. A temple dedicated of Zeus Akraios stood on the slopes of Mount Pagus. Smyrna also possessed a harbour where the Temple of the Mother Goddess and the gymnasium also stood. After the establishment of the Roman Province of Asia in 133 BC, Smyrna was rewarded with various grants and privileges, having sided with the Romans against the war with Mithridates. In AD 26, Tiberius granted Smyrna the privilege of building a local temple to the emperor (first neokoria). The city became “twice neokoros” under Hadrian whose benefactions to Smyrna exceeded all expectations. On a visit to the city in AD 124, Hadrian encountered one of the most renowned orators of his time, Antonius Polemon. Born in Laodicea, Polemon came to Smyrna as a youth to study rhetoric. He became the leading sophist of his generation and had his own school in Smyrna which attracted students from all over the Greek world. As a result of his fame, he became a major political leader and used his talents for the benefit of his adopted home. According to Philostratus, Polemon, who had won the emperor’s favour, persuaded Hadrian to spend “ten million” drachmas on Smyrna for the reconstruction of a grain market and a splendid gymnasium as well as “a temple that can be seen from afar”. Silver coin of Hadrian minted in Smyrna. (obverse) Bare head of Hadrian, right. (reverse) Temple with four columns, within which, the two Nemeses stand facing one another (the single goddess worshipped elsewhere became two at Smyrna). Hadrian’s benefactions are also attested by an inscription (ISmyrna 697) which lists the emperor’s gifts, including 1,500,000 drachmae, 98 columns to adorn the gymnasium, immunity from taxes, as well as the establishment of a sacred contest (Hadrianeia Olympia) with theologians (theologoi) and hymn–singers (hymnōdoi). The sacred games were held in the stadium of Smyrna where two altars dedicated to Hadrian Olympios have been discovered (ISmyrna 625 & ISmyrna 623). 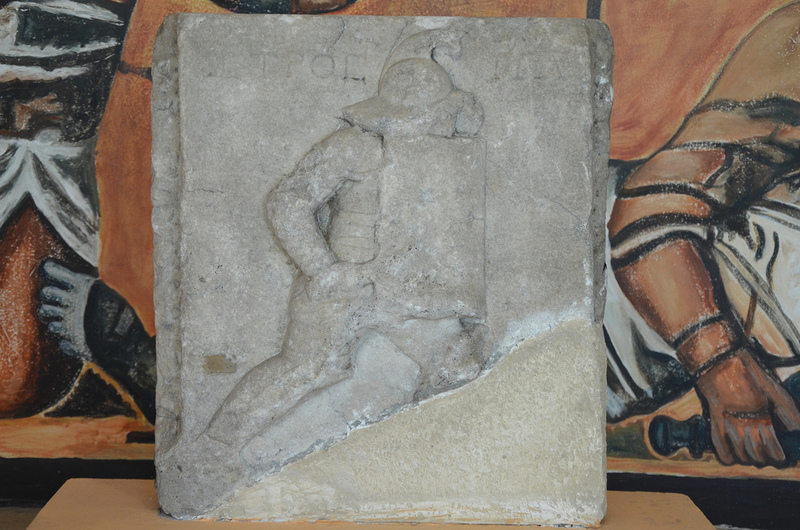 Funerary stele of a gladiaror, Hellenistic period. 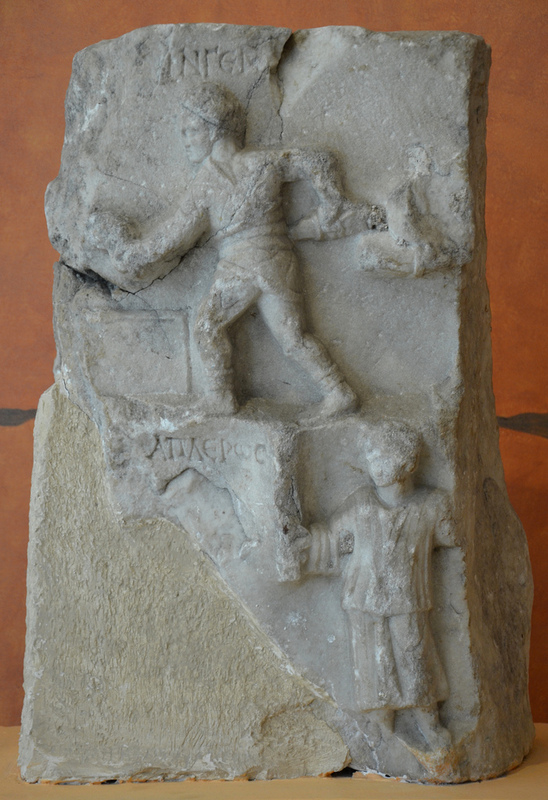 Funerary stele of a gladiaror, Roman period. In the year AD 178, a major earthquake hit Smyrna, destroying most of the city. Reconstruction work started shortly after the event with the help of Marcus Aurelius. This is confirmed by a portrait of his wife, Faustina the Younger, still visible over an arch of the west colonnade of the Agora. To Christians, Smyrna was one of the Seven churches of Seven churches of Asia. A Christian community was established there at a very early time, and bishop Polycarp was among the early Christians who suffered martyrdom in Smyrna at the time of Marcus Aurelius. After the Roman Empire was divided into two distinct entities, Smyrna became a territory of the Eastern Roman Empire. However, in Late Antiquity, particularly after the foundation of Constantinople, Smyrna entered a phase of decline. The studies and archaeological excavations have been very intense in the last three decades. The buildings most studied are those from the Agora of New Smyrna which, in its existing form, dates from the Roman rebuilding phase, as well as the Archaic Temple of Athena of Old Smyrna. An expropriation process has been continuing in the Agora since 1997 and archaeologists have recently extended the site’s excavation field. The most recent significant discovery is a rich collection of graffiti found in the Agora during excavation work inside the cryptoporticus of the Basilica. The graffiti (155 pictorial and 170 textual) are preserved on the plaster covering the north wall and many of the pillars of the basement of the Basilica. 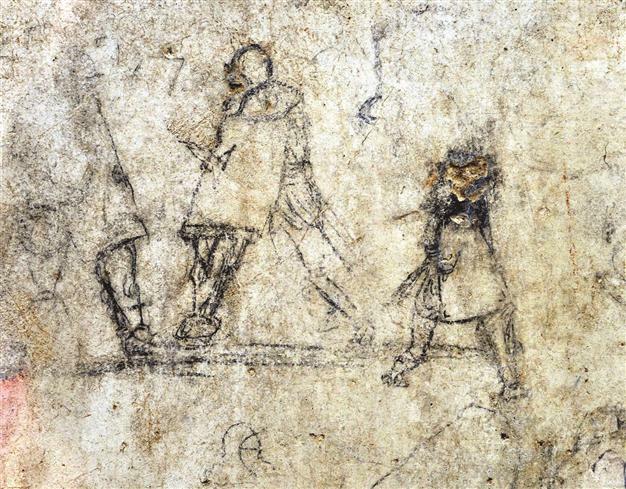 They show scenes of daily life with images of trade ships, animals and gladiators. 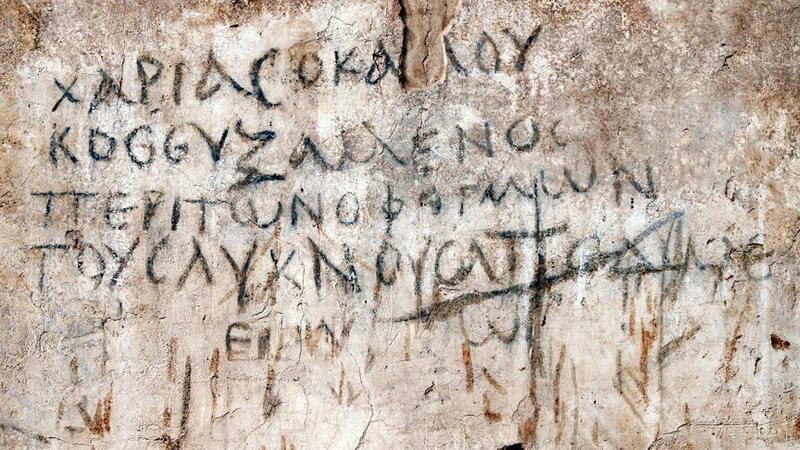 One graffito could even be interpreted as a representation of the temple of Hadrian that was built after his visit. They are estimated to date back from the later 2nd century (after an earthquake in 178) through at least the 3rd century AD. The basilica has been covered to protect the workers and the graffiti from the elements. At the site of Old Smyrna, Archaeologists have recently discovered ashes from the eruption of Thera, on the island of Santorini, that took place some 3,600 years ago. About 100 people, including academics and experts from Turkey and abroad, are taking part in the Smyrna excavation. There is still a lot to discover of Smyrna as modern constructions still cover many ancient remains. Archaeological works are currently unearthing the Hellenistic theatre which was buried for hundreds of years (see here). Another building that has been located is the stadium. After excavation work is completed, the sites will be accessible to visitors. Aerial view of Old Smyrna with the impressive temple dedicated to Athena and its well-preserved temenos terrace. The temple was the first religious building built by the Hellenes in Anatolia. It nderwent four construction periods from 725 to 550 BC. The Temple of Athena was brought to light during excavations carried out in 1948-1951 by Ankara University and the British School at Ankara. Architectural elements from the Temple of Athena, around 600 BC. Izmir Museum of History and Art. Aeolic capitals from the Temple of Athena, carving of tufa, 570 BC. The Archaic Fountain House built of andesite stones and thought to be have been used continuously until the middle of 4th century BC. The reservoir inside the fountain collected water from a small stream flowing to the east of Old Smyrna. The entrance to the İzmir Agora Open Air Museum. The excavated area of the Agora so far measures 129 m x 83 m. It is bordered on the east and west sides by porticoes, while the northern side is occupied by the basilica. It is so far the largest and best preserved among the Ionian Agoras. The Agora of New Smyrna was constructed during the Hellenistic period and was rebuilt in the Roman period under Marcus Aurelius. It was a multi-storey building with many spaces on different levels and an open courtyard. The bust of the emperor’s wife Faustina on the second arch of the western stoa, confirms the restoration phase under Marcus Aurelius. The Western Portico that surrounded the courtyard of the Agora. It was 20 m wide and just over 100 m long. The porticoes of Smyrna were a two-storied structure with a basement underneath. Plan and drawing of the Western Portico. The basement of the Western Portico constructed by using arches and consisting of three galleries. Architectural fragments of the Agora’s porticoes. On this architrave of the first storey of the western portico was engraved a 35m-long inscription with a dedication to the two Nemeses and to other gods. Architectural fragments of the Agora. Fragment of mosaic with geometric patterns uncovered in the Agora of Smyrna. 2nd century. Izmir Arkeoloji Muzesi (akg-images / De Agostini Picture Library). The western section of the portico basement was made a part of the water system in late Antiquity. Inscribed base statue (SEG 47-1637) of Claudius Aristophanes Aurelianus, neocoros of the cult of the Emperor at Smyrna, Severan period. The title “neocoros” is here used of an elite person who had the honor of officiating at the imperial cult temple at Smyrna. A marble grouping of three deities (Artemis, Poseidon and Demeter). The statues were used in an altar complex located in a central place in the Agora. Antonine Period. Plan and drawing of the Basilica. The civic Basilica occupied the northern side of the Agora. Measuring about 161 m by 29 m, it is one of the largest basilicas in Asia Minor. The building was built on a cryptoporticus used to level the ground. The well-preserved basement of the Basilica which consisted of 4 galleries measuring 4.40 m in height and 5 m in width. The first and the second galleries on the south were covered by 55 arches and were connected by passages or by doorways. Cross vaults located at the western end of the first and second galleries of the Basilica were added after the earthquake of AD 178. Architectural fragments of the Basilica. White marble was used for the columns, while reddish conglomerate was used inside the building for the columns on both storeys. The İzmir Agora excavations in 2014 unearthed the Bouleterion, where decisions were made during the Roman Empire. The 2nd century AD structure was large enough for the gathering of some 400 assembly members. Image courtesy of Murat Erkun. In Smyrna the streets were broad, well paved and laid out at right angles. The main street, called the Golden Street, ran across the city from West to East, beginning probably from the temple of Zeus Akraios and ending towards the temple of Cybele. Burrell, Barbara. Neokoroi: Greek Cities and Roman Emperors. Leiden, The Netherlands: BRILL, 2003. Bagnall, Roger S., et al. Graffiti from the Basilica in the Agora of Smyrna. NYU Press, 2016.